Since 1992, more than 55,000 members from around the world have shared their passion for collecting Steiff animals by joining the Steiff Club. Steiff Club Members will receive special benefits and discounts. The 2009 Steiff Club gift is an incredible 4-inch black Steiff alpaca bear with silver hand-stitched nose, bear claws, and mouth. (Incidentally, Steiff Club special editions can be recognized by a white "Button in Ear" tag.) Other Steiff Club benefits include the ability to purchase exclusive Club editions; a complimentary subscription to the Club's quarterly magazine; and access to the Exchange forum, to name just a few. 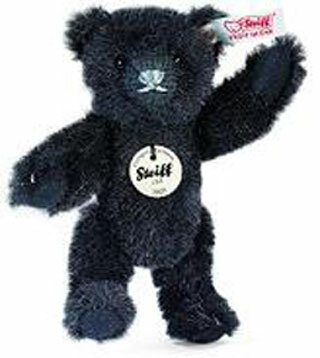 Your Steiff Club Kit is also included with the purchase of this 4-inch classic alpaca black teddy.